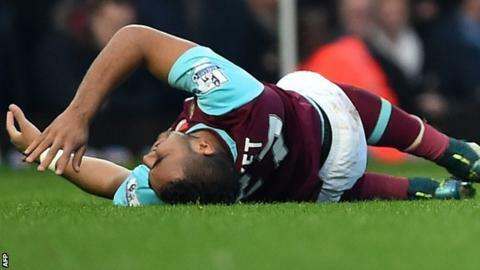 West Ham midfielder Dimitri Payet has been ruled out for three months with an ankle injury. The France international suffered the injury to his left ankle after a challenge from James McCarthy in the first half of Saturday's 1-1 draw with Everton at Upton Park. He tried to play on but limped off five minutes after the break. Payet, 28, has scored five goals in 14 appearances since his £10.7m summer move from Marseille. West Ham, who are currently sixth in the Premier League, say Enner Valencia's long-term ankle injury will be assessed by a specialist early next week. The Ecuador striker, 26, has been out since July after suffering the injury in a Europa League qualifying match.